Railpictures.ca - Doug Page Photo: Here is an interesting early merger consist heading west through Canfield in September 1968: NYC F7A 1832, PRR GP35 2346, a former PRR RS27 now in PC paint, and another PRR GP35. | Railpictures.ca – Canadian Railway Photography – photographie ferroviaire Canadienne. 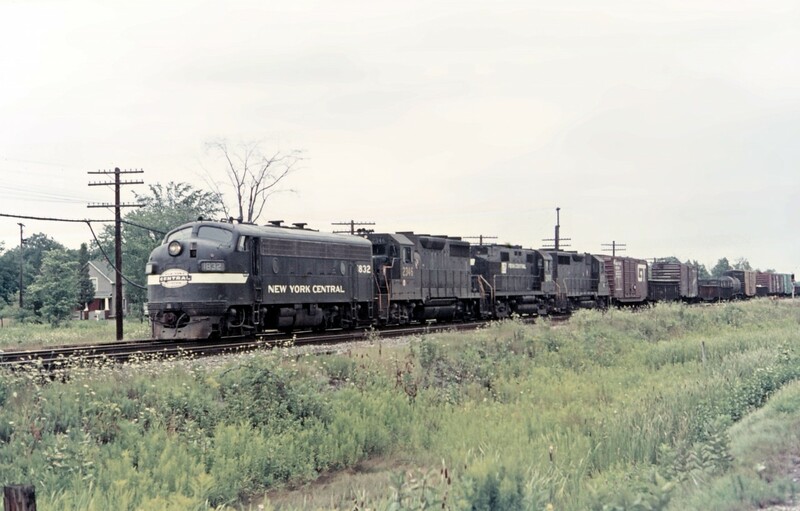 Caption: Here is an interesting early merger consist heading west through Canfield in September 1968: NYC F7A 1832, PRR GP35 2346, a former PRR RS27 now in PC paint, and another PRR GP35. great shots, keep these coming Doug!